10 years of Sitecore blogging – whereto now? So it all started in early 2006 with a post about IDTables (of all things…). I was a newly coined Sitecore Certified Developer, having recently left my “vanilla” .NET development consultant job to go work for one of the premiere Sitecore Partners and was now doing Sitecore full time. As the blog posts of that time will testament, I was very much learning at the time. I was thrown straight into a rather deep dive, doing work that involved custom Data Providers, item proxying and in general trying to figure out ways to best integrate a lot of external data into Sitecore. Early versions of Sitecore 5 were… let’s use the word “challenging”, and Sitecore documentation and release notes were scarce, at best. So yea; the first couple of years of blogging was almost entirely focused on sharing information that perhaps wasn’t otherwise apparent and openly discussing the direction Sitecore was taking on what I then believed to be a vitally important data integration features. These features are still important of course, but my view on this has become somewhat more nuanced over the years. More on this later. Right around the launch of Sitecore 6, we’re talking 2008/2009 here, I had left the safety of employment behind and had started CorePoint IT Ltd – my 1 man Sitecore freelance/contracting company and was trying to work closely with the Sitecore UK office on helping out new Sitecore partners as they were brought into the fold. Sitecore UK was a very different entity those days, only a handful of people, working very hard to spread the Sitecore gospel to the British Isles. “Yes, all fine and well, but how does that relate to this blog?”. Well it does, see. Unlike today, there WAS no real market for Sitecore contractors back then. We were maybe a handful doing it, and LinkedIn did not have a constant flow of “Contract Requests” coming through on a daily basis. So initially, I had a lot of time on my hands. I wrote what I believe to be one of the first ORM mappers for Sitecore – CorePoint Domain Objects; built a lesser known Ecommerce framework, and as my post count for 08/09 will show – wrote a lot of blog posts. It was all about visibility. And it paid off, too. Work started coming in, to pay the almost extortionist London rent rates. I was awarded Sitecore MVP as one of the 10 first in the world and things were getting busy. So much so that I pretty soon found myself almost drowning in work and Sitecore services was coming in demand all over London (it was still predominantly London, at this time). 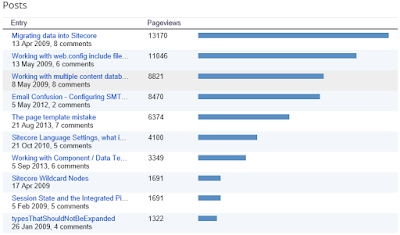 It also shows in my blogging activity ;-) More posts were written in 2009 alone, than all remaining 9 years on this blog. As a contractor, one doesn’t get paid to blog (obviously) and while many bloggers today find time to blog on their employer’s dime, I have always been doing this on my own time. Time I take away from either work or (more often) family activities. 2010 through 2012 was “more of the same”. I went back to Denmark due to a family related issue, ended up staying almost 2 years working almost exclusively with Sitecore ecommerce related sites and solutions – architected yet another version of an ecommerce framework (based on ideas developed in 2008/09 and further refined here) – again being kept so busy, there was little time (or rather; energy) to focus on other things such as this blog. 2013 sees me back in the UK, this time outside of London. The market in London was now brimming with Sitecore contractors (though still not enough, by far) and my idea was to head out west – to Bristol – and service an area that was not well covered by other consultants. Not long after (but entirely unrelated, although I like to claim otherwise ;-)), Sitecore themselves opened up a branch office in Bristol. Excellent news, this also meant local Sitecore User Group sessions – and I remember the very first one I attended, was when Sitecore 7 was being presented. Initially I get involved in yet more ecommerce on Sitecore with a local Sitecore client (as opposed to an agency) where I spent the better part of a year, but pretty soon thereafter it becomes apparent that the market “out west” isn’t all I had initially hoped. To keep work coming, meant I had to consider contracts pretty much all over the UK. That meant a lot of travelling, a lot of hotel rooms and you know… to be honest, it all became a bit too much. Visitors and readers – Who are you? Apparently, Blogger has decided to discard some of its data so unfortunately I cannot share with you the complete traffic numbers. Only data from the period "May 2010 – January 2016" is kept. So who are you? This blog doesn’t run on WordPress so I cannot do one of those fancy “You filled the Sydney Opera House 27 times over” type of posts. I do have some statistics to share with you however. All of this adding up to: “Pageviews all time history - 237,063” (again, since May 2010). In terms of what posts you liked, 2009 seems to have been the absolute golden year with 6 of 10 posts in the top 10 coming from that year. On a personal level it pleases me to see topics such a Sitecore migration at the top since this is one of the areas I would consider myself a specialist in. For some reason or other, I’ve just ended up doing SO many data migration projects with Sitecore over the years. Looking at this, I should probably schedule a few follow-up posts on this. 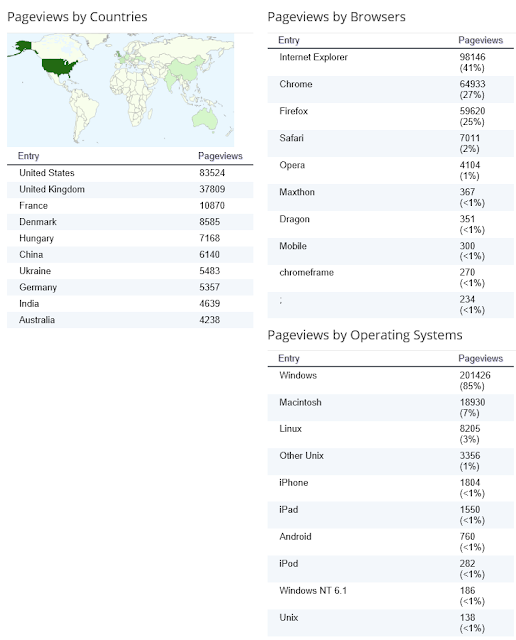 There is also a statistic for traffic sources that I won’t even bother screenshotting and posting here. 97+% of traffic comes from Google referral, the rest comes from StackOverflow and a few forum posts on Sitecore Community Forums. 10 years is a very long time. When speaking of Internet technologies it’s almost more than a lifetime. So no, I don’t actually know that I will be actively blogging and working with Sitecore, 10 years from now. What I do know, however, is that I expect to be. What I also know, is where I want this blog to be heading in the time to come. In my opinion, for this blog to have any justified existence (or any blog for that matter), it must be focused on original content. To me this translates to less “How-to” content, and more “Why or why not?” content. If you take a quick look around the Sitecore blogosphere landscape today, the reasons for this should be obvious. When I started blogging in 2006 there was little to no documentation, and probably there were less than 20 of us blogging. If even 10. Blogging original content was a no-brainer. We were all working with pretty much a blank slate and there was so much to talk about. 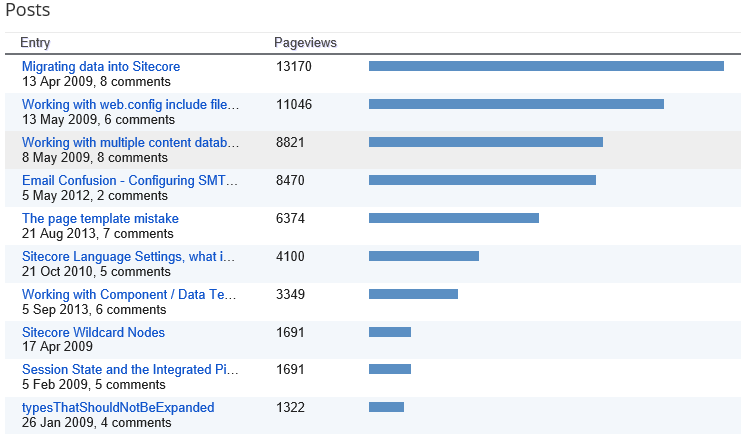 Today, 10 years later, there are more Sitecore blogs than I know the number of. I used to follow them all on a blogroll (up until Google shut down Reader :/) – today this is (almost) impossible. Impractical, at least. Ironically this leads to the almost exact opposite situation as we had in 2006; it is becoming increasingly difficult to now find quality information on any particular Sitecore subject. Not because it isn’t there; there’s almost too much of it. So anyway. To stay relevant, I am going to take my 10 years of experience, over 20.000 billed hours of Sitecore consulting, and put myself out there and post (even more) opinions. The way I see it, opinions and practices I have formed on working with Sitecore over all these years are highly sought after by employers and agencies; surely these must have value to the readers of this blog as well. So more “What does IoC and DI do to your development teams velocity?”, “What developer profiles make for good Sitecore developers?”, “The Content Release project milestone”, “How does Agile fit with your Sitecore development project?” – and less “Using Lucene and SOLR side by side with Sitecore Content Search”, “Load balancing your MongoDB setup”, “Multi-select dialogues with SPEAK 1.1”. To be clear, there is absolutely nothing wrong with the “less of” examples I mention here. I just won’t be focusing on them; I believe we as a community are pretty well covered on those as it is.